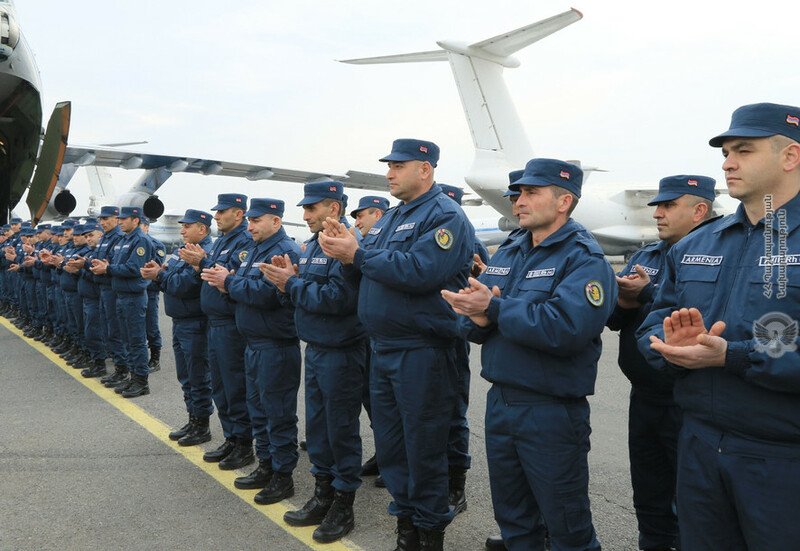 Armenia has sent 83 soldiers to Syria as part of a Russian-backed demining and humanitarian mission there. For years, Russia has been asking its military allies to help out in Syria, but until now no one has taken them up on the offer. The Armenian offer comes as Yerevan-Moscow ties have been frayed following the rise to power of Nikol Pashinyan and his team of pro-Western allies. The Armenian side strove to emphasize the non-combat nature of the deployment. “The Armenian specialists will carry out humanitarian activities, connected with demining, anti-mine education, and providing medical assistance in Aleppo, exclusively outside areas where military activities are being conducted,” the Armenian Ministry of Defense said in a February 8 statement. The statement also noted that the soldiers were transported to Syria by Russia, and will operate with Russian logistical support while they are there. “I express a huge thanks for the aid that Russia has provided, especially the Ministry of Defense and you personally, in organizing our humanitarian aid for Syria. You have made a large contribution,” Tonoyan told Shoigu at their joint appearance in Moscow, the Russian Defense Ministry reported in a statement. Russia has been pushing its allies in the Collective Security Treaty Organization (CSTO) to send peacekeepers to Syria even before Russia itself got militarily involved. (The CSTO includes Armenia, Belarus, Kazakhstan, Kyrgyzstan, Russia, and Tajikistan.) Armenia has been mooting the possibility of sending deminers to Syria since 2017. In November, Armenia formally recalled Khachaturov from his position as secretary-general, whose term was supposed to end in 2020. That prompted a leadership struggle within the organization which has yet to be resolved. Yerevan had hoped to replace him with another Armenian official to fill out the remainder of Khachaturov’s term, but other CSTO members have had other ideas and appear to be coalescing around another candidate: Stanislav Zas, chairman of Belarus’s National Security Council. As it happens, the day before Armenia’s Syria deployment was announced, Zas told journalists in Minsk that every CSTO member state except Armenia supported his candidacy. And he said that while he had met with the presidents of all the other CSTO member states in December, Armenian officials have yet to respond to his request for a meeting. The decision is supposed to be made by consensus, but Zas also suggested that a new secretary general could be named without Armenia. “This isn’t the best variant. These decisions should be made by consensus. This is the guarantee of normal, uninterrupted work. We hope that a decision can be made on a consensus basis in the near future,” he said.